The film also features Daniel Balaji, Ashok, Velu Prabhakaran, Aadukalam Naren, Bhagavathi Perumal and director Ramadoss. The teaser of first lady gangster film Gangs of Madras with Priyanka Ruth as the lead protagonist created a huge impact for its violent content and raw approach. 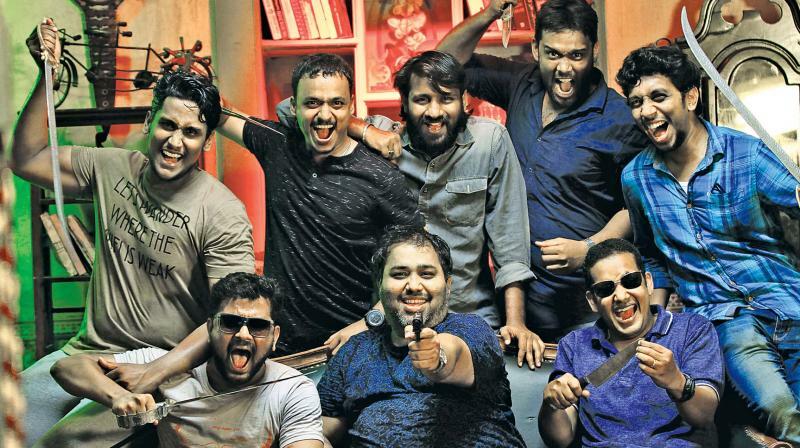 Ace producer CV Kumar, known for his cult films like Pizza and Soodhu Kavvum and who turned director with a sci-fi thriller Maayavan, is once again wielding the megaphone for this unusual genre. The film also features Daniel Balaji, Ashok, Velu Prabhakaran, Aadukalam Naren, Bhagavathi Perumal and director Ramadoss. On Priyanka Ruth: I auditioned at least 100 girls. Priyanka Ruth was very good. She underwent proper training before getting into the real acting. I was very particular that when she hits 10 men, it should not look like mockery on screen. So, I wanted her to do all the action blocks herself without a body double. And told my stunt master Hari Dinesh to compose them shot by shot. We went and shot in narrow lanes in real locations in North Chennai and even cars won’t enter them. Priyanka was so casual and did not demand anything. She was very focused also. She has to concentrate on action as well as match her voice modulation, which was challenging. She pulled it off extremely well. GOM a visual film: It is more of a visual film than dialogues, more expression oriented. There is a lot of emotions. Rerecording plays a crucial role. All technicians have put in their best and when everyone does their job honestly, the ‘magic’ will happen. GOM has shaped up very well. On shocking scenes: More than shocking, it is closer to reality. I have given a raw approach. Even Censor Board members asked what certificate I expect for this. I said I was okay with even ‘A’ Certificate. New dimension to actor: He was very happy and he plays a different type of dada. If you had noticed, he has his own style of dialogue delivery, which I have deliberately shunned. In fact there are hardly any dialogues for him. On Santhosh Narayanan: After I cut the teaser, I asked him if he could do the rerecording for it. He immediately agreed and was so impressed with the making and style and asked who is doing the music. And he evinced interest to do the background score.